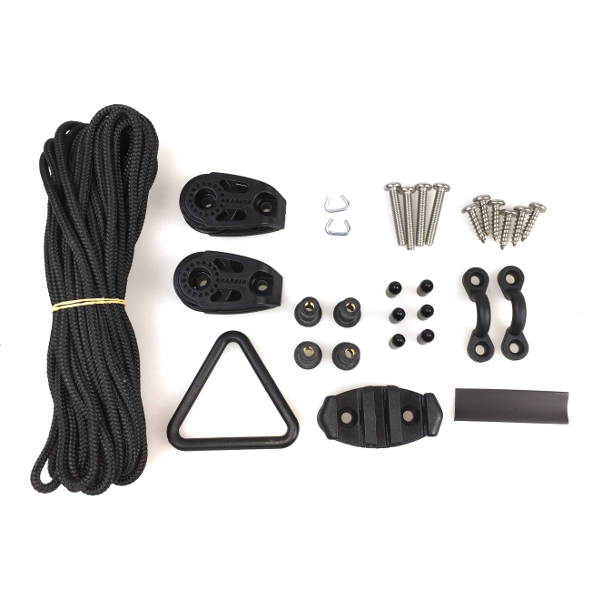 So, you’ve got a YakGear Deluxe Anchor Trolley and you need help installing it! Note – If you don’t have one yet, you need to jump over and read Top 4 Reason You Need an Anchor Trolley! The installation process is broken down step by step in this video and the instructions can also be found in written form below! Before starting the installation process, be sure to read/watch through all the instructions to make sure you understand everything before drilling into your kayak! Without Inside Access: Without inside access, drill a hole with a 3/8 inch drill bit 3 inches down from the deck and between 9-12 inches from the bow and stern of your kayak. Slide the black well nut (attached to the pulley) into the hole. *DO NOT USE WATERPROOF SILICONE IN THE HOLE AS IT WILL MAKE THE WELLNUT SPIN AND NOT GRIP. – Put the long Pan Head screw provided through the inset side of the pulley and tighten using a Phillips head screwdriver. Use the pulley hole to mark your second screw and wellnut placement and using the 3/8 inch drill bit, drill the second pulley hole. – Use another Pan Head screw and tighten fully. Be sure to tighten both screws firmly. – With Inside Access: With inside access, drill a 5/32 inch hole, use the Pan Head screws provided for the holes in the pulley but use the wellnut on the inside of your kayak. When you tighten the wellnut in both installation examples, it will create a watertight seal. Install the second pulley the same. Using the pad eyes as a guide for the trolley line, determine placement of the pad eyes by placing one pad eye 1/2 way between your seat area and the pulley on the bow, then repeat with another pad eye 1/2 way between your seat area and the pulley on the stern approximately 3 inches down as you did your pulleys. 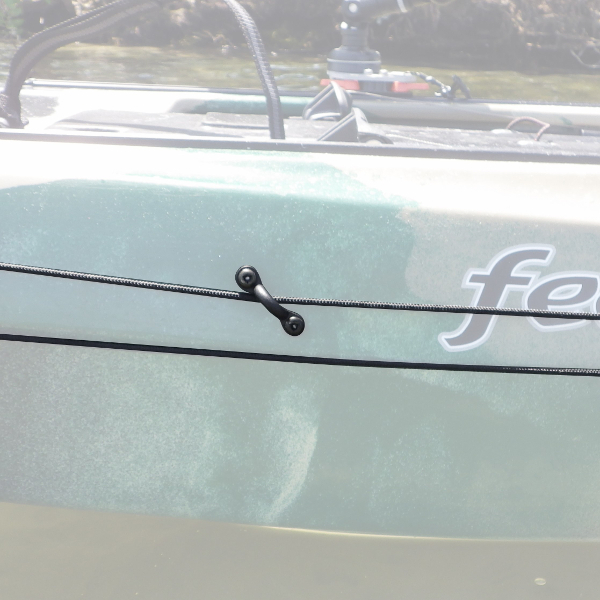 Make sure to angle the bottom of the pad eyes toward the center line of your boat. This placement being represented as <bow-center-stern>. This angle toward the middle of the boat helps prevent the rope from sagging. – Once placement has been determined, use pad eyes as a template to mark drill holes with a sharpie. – With inside access, drill 5/32” holes where pad eye hole markings were made. Secure screws and locknuts with a screwdriver and pliers. – Without inside access, drill a 3/16 inch hole and use the rivets with a rivet tool. Always make sure to use Waterproof Silicone wherever you drill except around the pulley wellnuts. – Note – A combination of with and without inside access installation methods can be used on different parts of the boat, depending on the placement of the inside access vantage points. Placement of the zig zag cleat needs to be on an easily accessible point from your paddling position. The zig zag cleat allows a locking mechanism when the desirable positioning is determined while anchored and also when the trolley is not in use. This prevents changing currents and tides from disrupting the anchored position. – Once the position is selected, use the cleat as a template and mark where to put the self-tapping screws. Apply waterproof silicon on the marks and on the back of the cleat and secure with self-tapping screws. 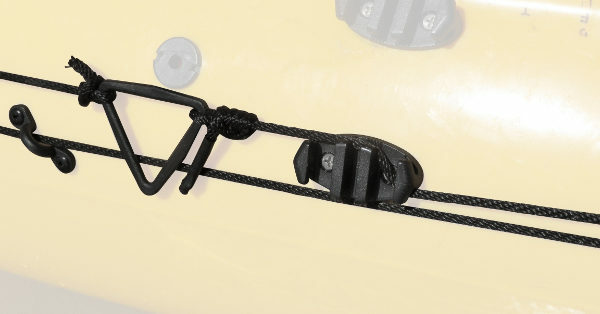 – When not using the trolley but the anchor line connected to the tether in the cleat. When using the trolley, use the trolley line in the cleat to stop the travel of the trolley line for best positioning. – Feed the line up through the pulley on the bow, across and through the pad eyes and down through the other pulley that is installed on the stern. The loose ends of the trolley rope will be hanging on the floor. – Next, attach the stern end of the trolley rope to your anchor tether (Triangle). Connect one end of your trolley line by tying a 5-6 loop fishing knot as in the picture. Leave 2-3 inches of excess trolley line after your knot because this nonpermanent knot will allow for adjustments in length when the rope shrinks or loosens in the water. Therefore, if your trolley rope ever tightens or loosens, you can undo your knot and retie the line to adjust. – To attach the other end of your trolley line, first slip the piece of shrink wrap over the end of your trolley rope and slide it out of the way. Loop the rope around a corner of the tether and crimp the end of the rope to the body of the rope (approximately 1.5” down from the end) using the hog rings and a pair of pliers. This will result in a permanent bunny ear loop, enclosed with the triangle in the loop. – Crimp the loop closed and then slide the shrink wrap up from the single width rope and over the now double width rope and hog rings. Use a hair dryer or lighter to shrink the shrink wrap, while being careful not to burn the rope. – Finally, feed your anchor side of your line through your Zig Zag Cleat so you’re anchor tether hangs right next to it, ready for an anchor to be attached. When your trolley is not in use or you want to stop the movement of the trolley, simply lock one line or the other into the Zig Zag Cleat. We want to know what you think about these anchor trolley installation tips! What helped you when you were installing your anchor trolley? Tell us what you think! Comment below, reach out to us at socialmedia@yakgear.com or find us on Facebook, Twitter, and Instagram using the #YakGear hashtag!